When modeling surface models, such as a frame joint or similar structures, there is always the question of how to model a prestressed bolt connection. In this case, it is always necessary to find a compromise between the practicable and detailed solution. The following article describes the modeling procedure of such a connection based on the joint diagram calculation method. The joint diagram is a graphical representation of forces in a prestressed bolt connection. In this case, the compression forces arising in the components to be connected and the accompanying deformations are contrasted with the forces and deformations in the bolt. Figure 01 shows such a diagram. The blue line (characteristic line) represents a graph of the bolt, the yellow one a graph of the structural components. Typically, the bolt stiffness is smaller than the stiffness of the structural components. However, there are also various exceptions such as in the case of nuts. The intersection of both lines represents the preloading force in the connection without any external load applied. The end point of the bolt line is the maximum resistance force in the thread. In addition to the bolt line and the component line, there is another important characteristic line of the external tensile force (also preload). This line is shown in gray in Figure 01. It originates from the characteristic line of the components on the y‑axis of the desired residual clamping force. The residual clamping force is the force that still holds the components together. For example, if there is a horizontal force to be absorbed by the connection (without shear strain of the bolt, so only by the component friction) in addition to the tensile component in the case of the existing working load, then the residual clamping force must be selected in a way that there is sufficient resistance. In addition to these characteristic lines, there are other lines that can be used for a more detailed representation. However, since these lines have no influence on the basic procedure, they will not be explained further in this article, and the presented simplified joint diagram will only be used. For example, the additional characteristic lines would be due to the compression set or the eccentric stress and load. The cross‑section area AP depends on the thickness, in contrast to the bolt. It is assumed that the load is extended at an angle of approximately 60°. There are three various cases, as shown in Figure 02. In Case 1, the components between the bolt and the nut are like a sleeve and this sleeve diameter is maximally equal to the bearing surface diameter of the bolt or nut. Case 2 covers the range where this sleeve diameter is minimally equal to the bearing surface diameter of the nut or bolt, and maximally equal to the diameter of the load extension cone (marked red in Figure 02). This stretches symmetrically from both sides, and the diameter is the largest in the middle of the clamping length. Case 3 covers the range from the maximum load extension cone to the infinite plate extension. For this reason, it is necessary to calculate the replacement area Aers. Aers corresponds to the cross‑section area of a replacement cylinder with a constant load extension. Since the load application point in a surface model is not necessarily at the top of the component (the plate), but always in the middle of the surface, the plate stiffness must be determined on this load application point. For this, the load application factor n is introduced, which reduces the clamping length accordingly. This problem is illustrated in Figure 03. The model should be a good mix of accuracy and practicability. Therefore, the connection will consist of surfaces, members, and contact solids. The model includes two superimposed square surfaces with a hole (diameter dh) in the middle, which have the dimensions 60 x 60 mm (to fulfil DA > dW + lK). Since t1 = t2, this results in a plate spacing of 10 mm. The load acts directly in the middle of the plate (neutral fibre). Thus, the resulting n is 0.5. The model is supported by a fixed support at the bottom end of the bolt member. In order to achieve the total support force equal to zero, the load must be applied to both the upper and the bottom plate. The load is 6.95 N/mm² for 25 kN of the total force. For a good load transfer between the bolt (beam) and plates, a rigid surface (ring) with the outer diameter dW is modeled around the hole. The connection between the plates is generated using three contact solids. One solid is around the hole without the rigid surface part, two contact solids rest around the hole like two shells. The contact solids must have the same material as the plates to reflect the stiffness between the plates accurately. Furthermore, the contact fails when lifting, and it has a rigid friction in the horizontal direction with the factor of 0.1. The structure is displayed in Figure 04. Number 1 shows the surfaces and members with the actual dimensions. Number 2 shows the upper surface with the beam (bolt) and the rigid members, which represent the connection between the bolt and the plate. The rigid surface (pink) has also a rigid member on the inner edge to be able to transfer any moments. Another important point is the FE mesh. Because of small dimensions, the main FE mesh size for lFE has been set to 2 mm. Moreover, the surface mesh refinement has been defined with lFE 0.2 mm on the rigid surfaces. Since the bolt diameter nor the working force on the bolt are known in practice, it is possible to model the structure without the hole and to use a rigid member instead of a beam for the first design of the model and for the determination of the bolt forces. This model for pre‑dimensioning is shown in Figure 05. In order to be able to detect the residual prestress in the model, a result member was attached parallel to the bolt (distance 0.1 mm). This includes all internal forces of the contact solid. To compare the solutions, it is necessary to create the joint diagram first. The required values are listed in Table 1. By substituting the values for the practical example (see above), the intermediate values and characteristic lines shown in Table 2 are obtained. Table 3 includes the summary of the most important values analogous to Table 1, and Figure 06 shows the complete joint diagram. For the numerical solution, two load cases were initially created. The first load case (LC1 Prestress) includes the member load of the prestress, and the second case (LC2 Working load) includes the working load. Furthermore, the load combination of both load cases (factor 1.0) was generated (LC1: LC1 + LC2). The calculation is based on the linear static analysis with 15 load steps (better convergence in the case of contact solids with failure). The iterative additional force FZus,i can be obtained after calculating the load case on the member in Figure 07. Thus, the resulting prestress is 36 kN in both cases. This allows for a recalculation of the load case. The result is shown in Figure 08. The deformation is thus 0.6 μm greater than the calculated deformation fMmax. The result of the calculations subjected to the working load in LC1 is shown in Figure 09. The bolt member has the result of 33.9 kN. This member force can be compared to the force FSmax = 35 kN (see Table 1 and Table 3, Working load). The difference is 1.1 kN. The deviation of the differences is also important here. According to the analytical calculation, the difference should be equal to the force FSA = 1.8 kN. However, the difference of the FE model is only half as great with 33.9 kN − 33 kN = 0.9 kN. Thus, the deformation is about 1.4 μm smaller than the calculated deformation fMmax. Finally, the results in the result member are compared. As you can see in Figure 09, the load for the result member is the compressive force of 10.6 kN. This value must be compared with the clamping load FK = 10 kN. This results in a deviation of 0.6 kN. Table 4 includes a summary of all results. As shown in Table 4, there are partially large differences between the models. Generally, the largest matches are in the Prestress load case. Depending on the evaluation of the result member (plate) or the bolt member, the deviations from FMmax are 3.6% or 0.6% (referred to the analytical result). These deviations can be caused by the fact that both plates have no rigidity in the z‑direction and the contact solid has only one FE element in its thickness. Thus, there can be no load extension within the solid. The load transfer in the solid is done exclusively via the deformation of the plate by bending and shear force. It is obvious from the values that the FE model in the Prestress load case in combination of plates and contact solids has smaller stiffness than in the analytical model (see the smaller deformation). At this point, the higher stiffness of the bolt can be excluded as this is determined by the beam theory and the cross‑section. On the other hand, there is a smaller deformation in the case of the load combination in the FEA model, or the bolt force has significantly smaller increment. This again indicates the higher stiffness in the plate. In summary, there is only one explanation for this: The composite of a plate and contact solids has a different load extension so the approach from Formula 3.2 in the FEA model is not valid in the form. It would be probably necessary to examine on a real example or on an extended FEA model to find out which one of both solutions is closer to reality. However, it is important to note that the residual clamping force is almost identical in both variants. Thus, the prestress in the connection is modeled well and can be used for the joint analysis. 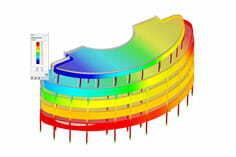 Modeling a prestressed bolt connection by using contact solids, surfaces, and beams is a combination of practical solution and real display. Practical means that the computing time is significantly smaller, compared to the calculation with FEA solids, which would probably represent the connection more accurately. However, it is necessary to improve the bolt design or to perform further analysis, which sets the results in relation with the reality. Since the preloading forces and the residual clamping forces largely correspond to those from the analytical calculation, it can be assumed that this modeling type can be used for the connection analysis. Association of German Engineers. (1986). Guideline VDI 2230 - Systematic calculation of highly stressed bolted joints. Berlin: Beuth.